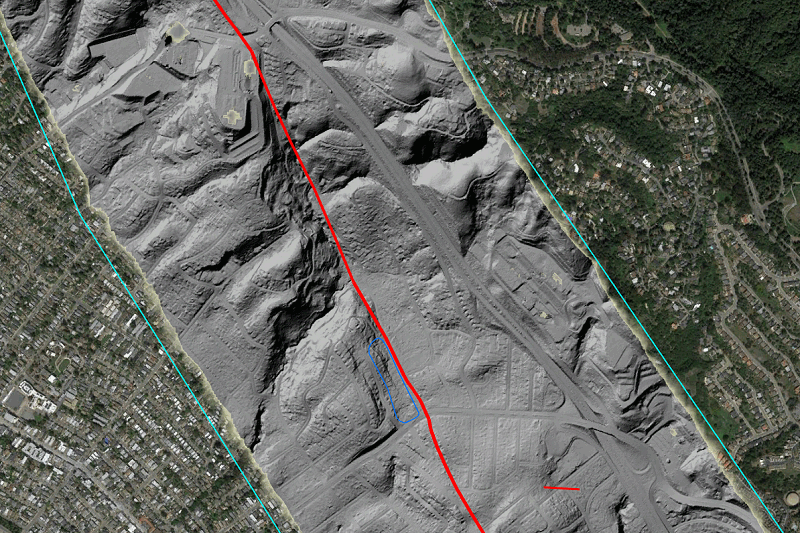 Of all the East Bay cities, Oakland owns the longest stretch of the Hayward fault. In my very second post, back in 2007, I suggested that we take over the name, and a couple years back I pointed out eight iconic places to see the Oakland fault in action. To those who still can’t get enough of this amazing geologic feature, this post’s for you. 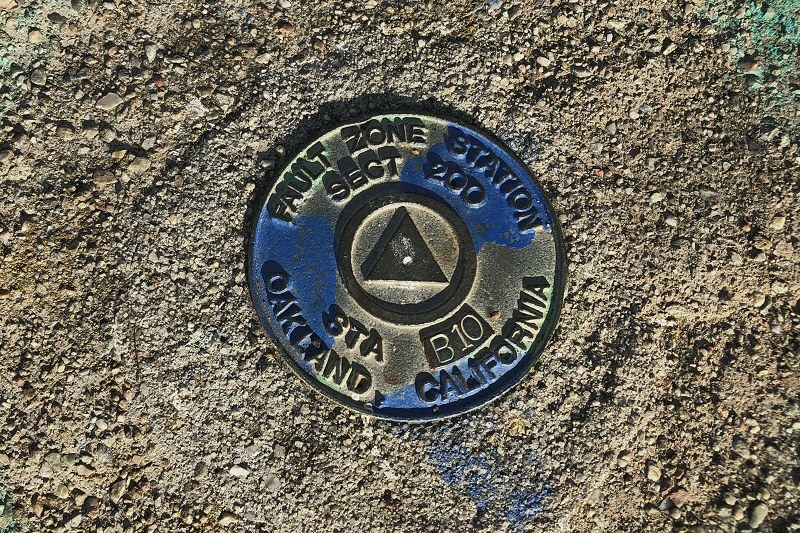 There are seven places in Oakland where alignments of markers are laid out across the fault trace. 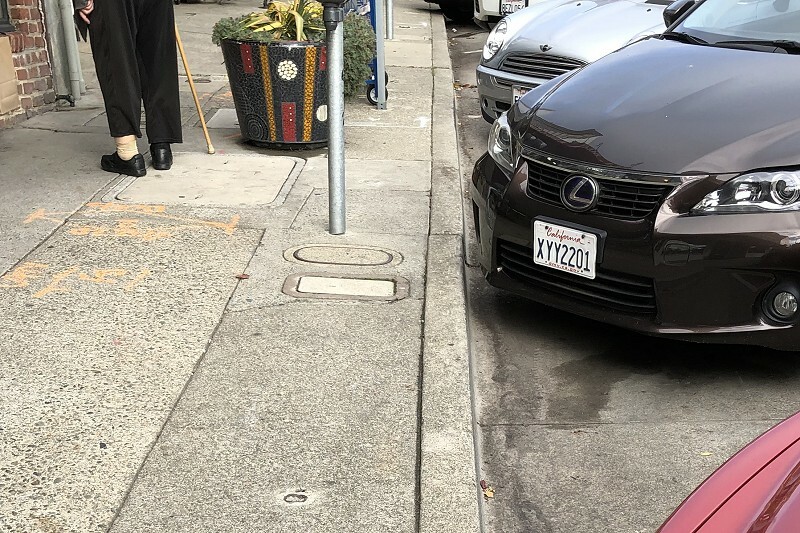 These are measured regularly by a team of scientists from the San Francisco State University Fault Creep Monitoring Project using a high-precision theodolite — an electonic gizmo mounted on a surveyor’s tripod. After my last post, I visited all seven places. Let me show them to you, north to south. This line runs along Broadway as it passes Lake Temescal Regional Park. The signs of the fault here (unlike the beautifully cracked sidewalk next to the park staff building) are subtle, and I’ve never felt confident of the exact trace. Nor are there definitive markers. 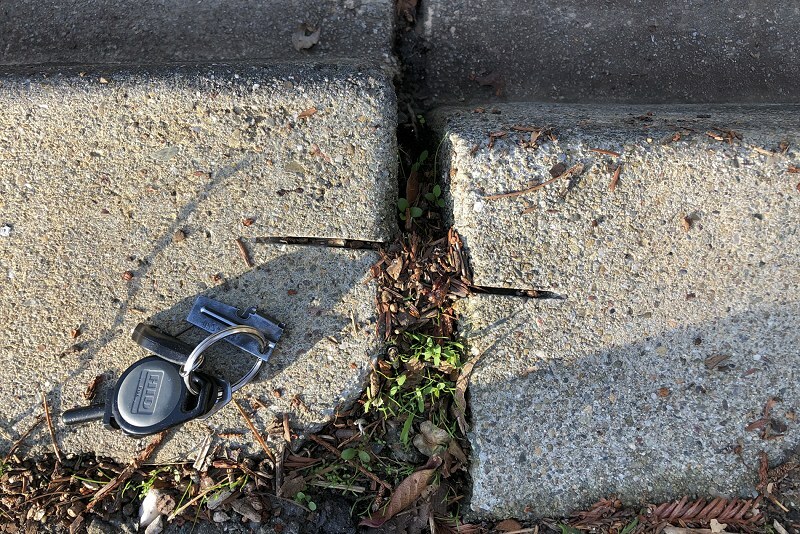 This nail in the concrete is the best candidate, across from the park entrance. Each alignment station is supposed to have three markers, but I was happy to find even one. It’s probably just as well they aren’t obvious, or people might mess with them. 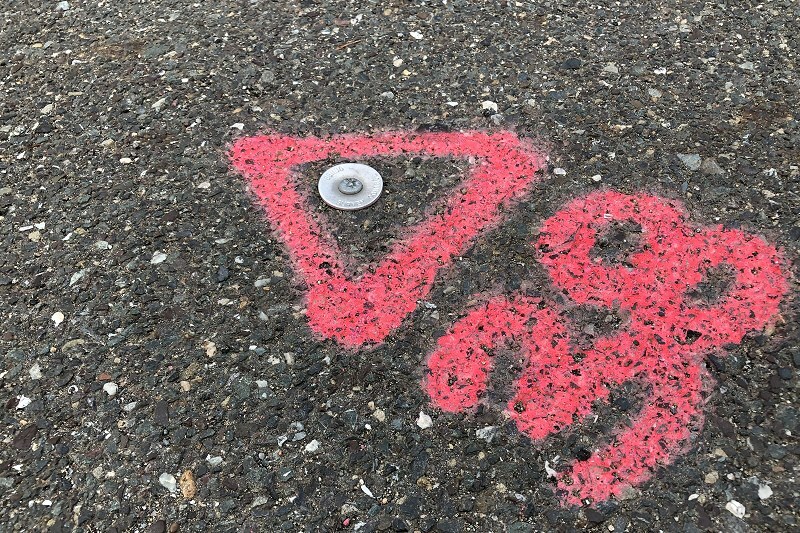 What they do with the marks is carefully measure the angles between them, then use the data to calculate how much creep movement has occurred along the fault since the crew’s last visit. 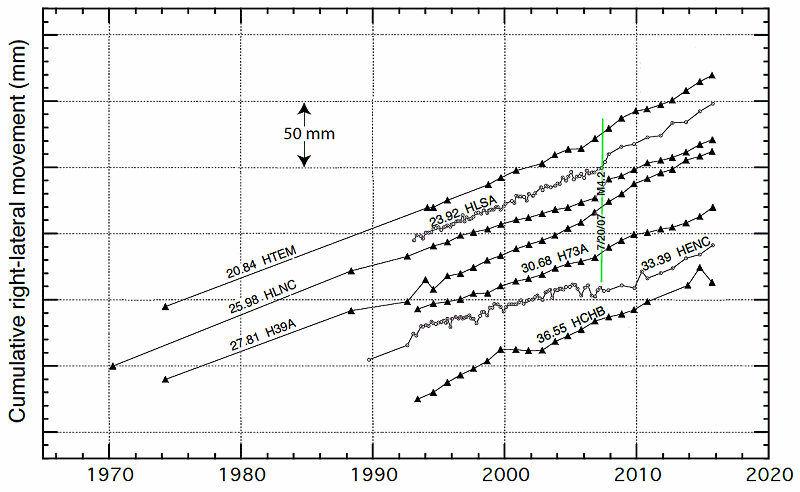 At this station, creep has measured 4.2 millimeters per year since 1974. The other thing is that there are lots of things in the street that could be used, like this longstanding fixture. But even without the markers, the fault itself is evident where the sidewalk has been warped over the years. 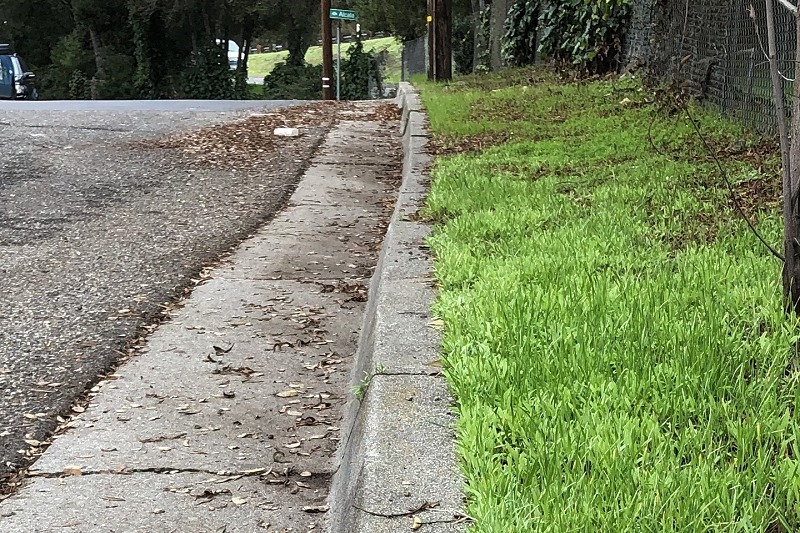 This view is looking up the north side of the street where the curb has been slowly distorted, the near side creeping leftward by 4.6 millimeters per year. If there weren’t so many furschlugginer cars and stuff in the way, you could see these features more easily. 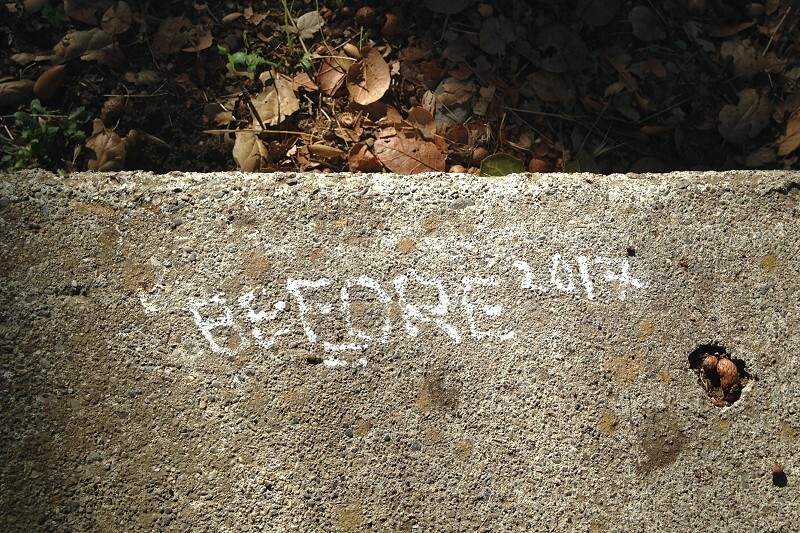 This site has been visited since 1970, the longest-running series of creep measurements in Oakland. 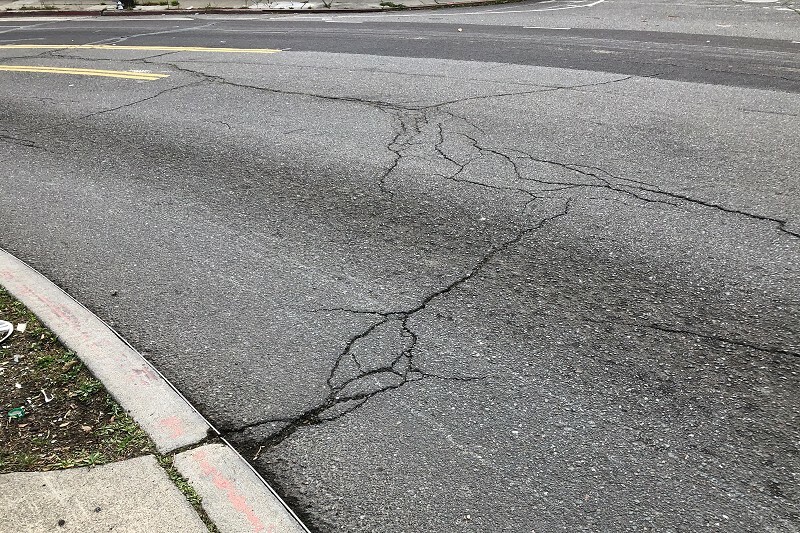 It’s at the entrance to the LDS Temple complex, and the fault regularly cracks the pavement next to the Stake Center at the east edge of the property, on its way to the London Road landslide site. This little thing at the head of Maiden Lane might be one of the marks. It certainly looks old enough. Other possibilities include this unobtrusive saw cut. Or this more prominent mark. But you know, all kinds of people have precision business on the ground — utilities, builders and so on. It really sinks in once you start closely inspecting the places you visit every day. 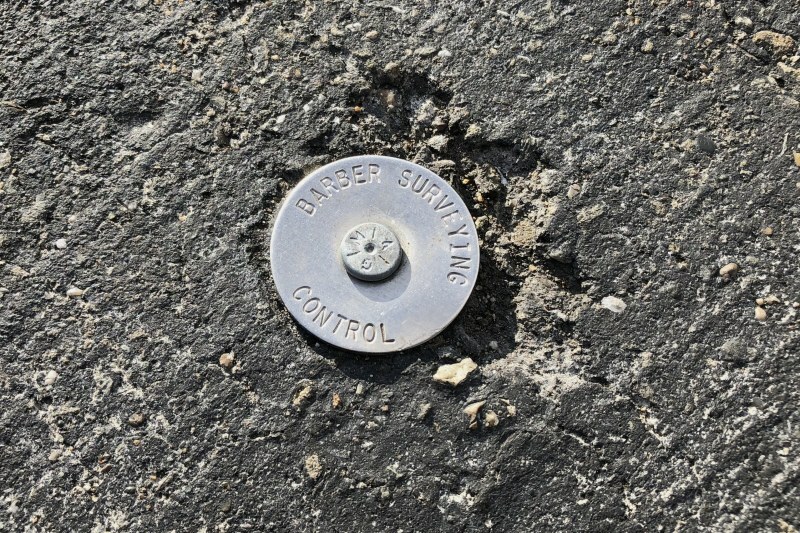 And unlike the beautiful brass USGS benchmarks you may have seen, the markers used by the scientists who survey the fault don’t need to be fancy at all. Creep at this location averages 3.8 millimeters per year. I’ve featured this location before (twice, in fact), but this time I found the fine little marker shown at the top of this post. 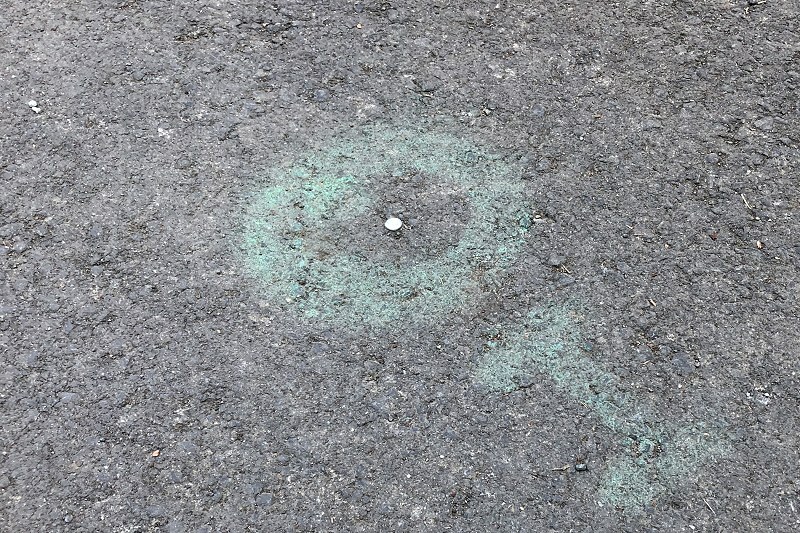 Notice the circle of greenish spray paint around the marker. You’ll see it more in the following stations. 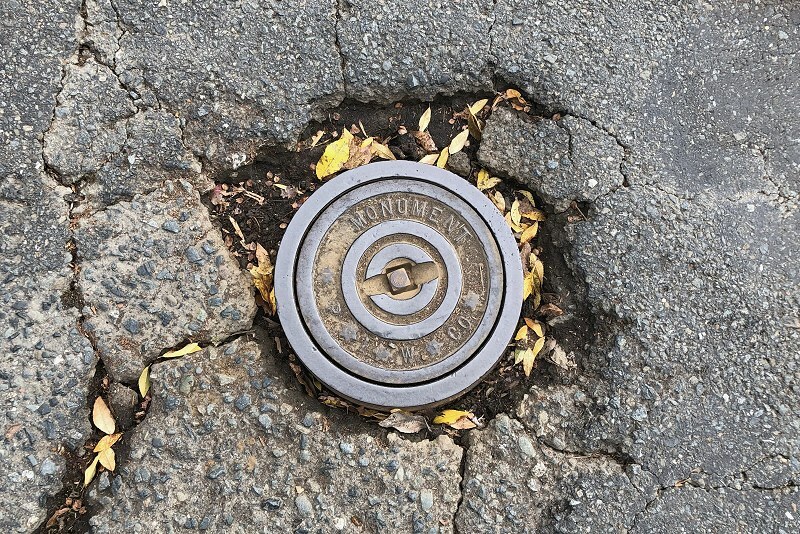 While I was there, I updated my shot of the sawcut in the curb. It’s continued to move, though not at the 4.1 millimeters-per-year pace of the fault as a whole. Creep displacement usually takes place across a wider zone measured in meters, not a single crack. Maybe in years to come it will be as famous as the Rose/Prospect corner in Hayward once was. This station is at the tight hook in the road where 73rd tops Millsmont ridge and becomes Sunkist Drive for one block. Like the LaSalle station, it was started in 1993. I think this is the real one; note the green paint. This site has been off my radar as a creep locality, but it has possibilities. 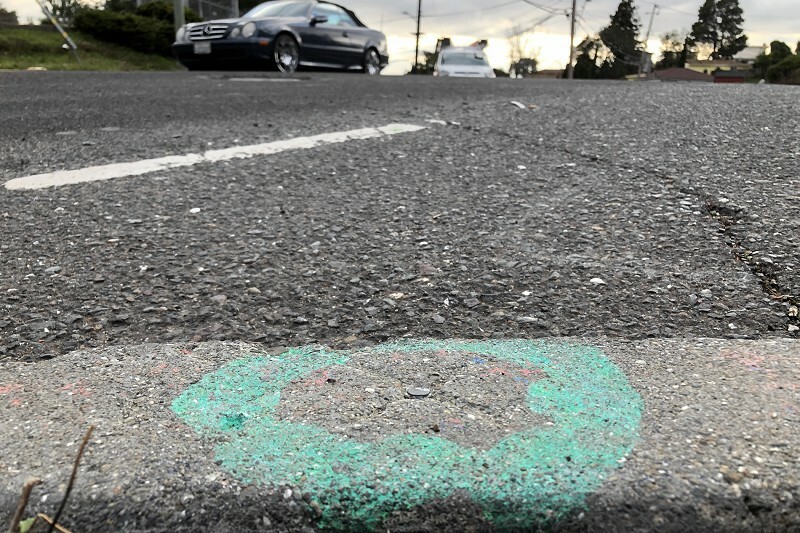 The cracks here in 73rd Avenue may resolve into a definite fault trace, if the city doesn’t pave it all over first. Creep here has averaged 3.4 millimeters per year. Measurements began on Encina Way, just north of I-580 off Golf Links Road, in 1989. I’ve taken groups here to show them the offset curbs, which are easy to see. But I had never sought out the creep stations. 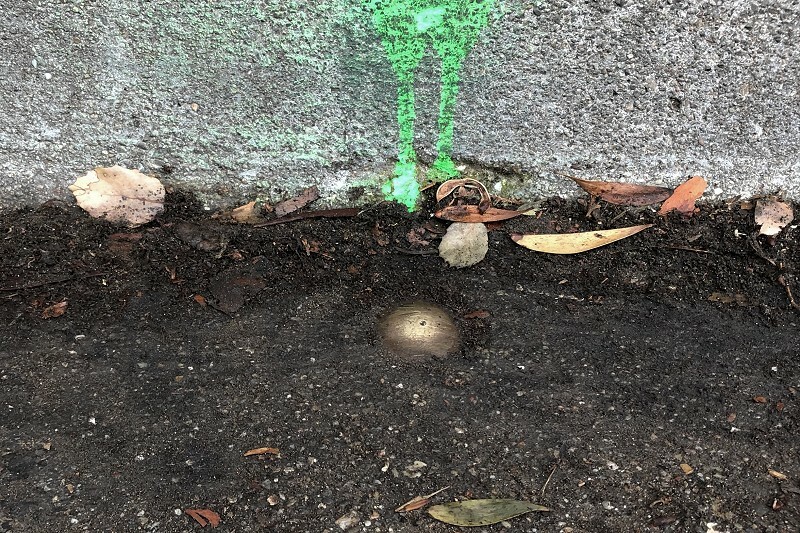 A splotch of green paint led me to this elegant little bronze dome nestled up at the curb, the size of a half-dollar, with a dent at its center. Creep here has averaged 3.3 millimeters per year. 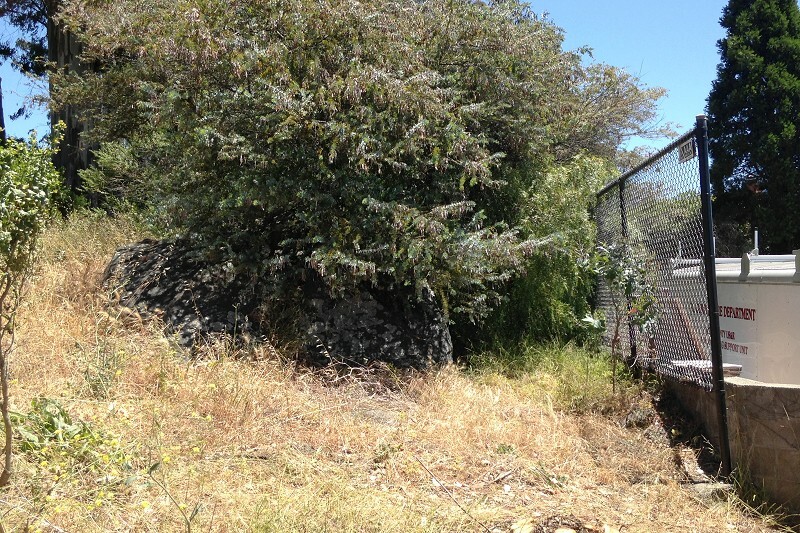 Yes, Chabot Park is run by the City of San Leandro, but it sits inside the Oakland city boundary. Nine years ago I made note of a long row of spikes driven into the road up to the dam. I assume that was the original line established in 1993. It’s much more elaborate a setup than is needed for a simple creep measurement. Perhaps it was a master’s project aimed at measuring the details of the wider active trace of the fault; perhaps it was something else entirely. All I know is that earlier this month I revisited the park and saw the road had been repaved, erasing all sign of the spikes. I did see this nail, though, and there’s the telltale paint too. Creep here has averaged 4.0 millimeters per year. Finally, here’s a portion of a cool graphic in the USGS report (800 x 500 pixels) showing the motion measured at these seven stations. It shows the variations that affect the data — some from the annual wet/dry climate cycle, some from the fault itself — and the effect of our largest local earthquake, the 4.2 shaker of 20 July 2007. The report gets updated, so check it once this post starts getting old. 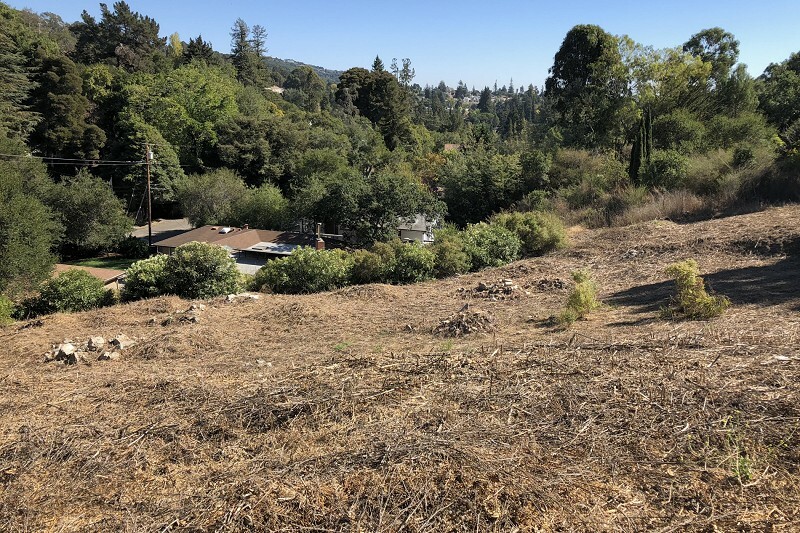 I spent some time last week in a concerted effort to examine the site of the 1970 London Road/Wilshire Heights landslide. (It took me five years to return to this haunted scene!) The effort was fun, but I learned more at home than I did on site. Gather round the campfire and I’ll tell you the whole tale. 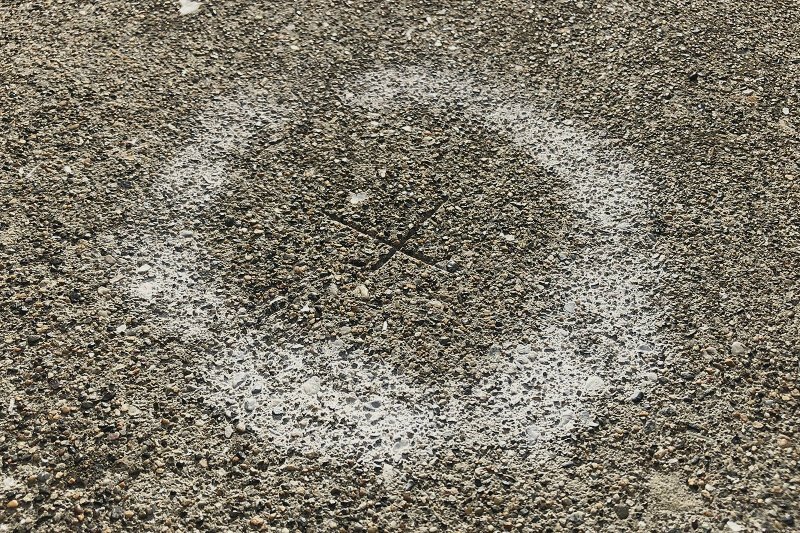 To start with, here’s the most visible sign of this notorious event: the missing side of Kitchener Court, a hard-to-get-to cul-de-sac just south of the LDS Temple parking lot. I took this shot through a chainlink fence as a lone crow cawed. Deep in the night, the land on the left side, along with its houses, fell into the narrow headwater valley of Peralta Creek, where it pushed a row of recently built homes off their foundations down below on London Road. To orient ourselves, here’s a time series of road maps with London Road in the center. Click it to see its full 1300-pixel width. Today the whole south end of London Road is gone, except for a tiny stub at the top of Maple Avenue. The north end, of later vintage, extends south from Maiden Lane. The 2018 map, from Google Maps with terrain visible, shows the topographic setting well. Once upon a time London Road ran up a steep, secluded little wooded valley. It was platted in 1923 as part of the Wilshire Heights development and named for Jack London. It was built out by the late 1950s, after surges of homebuilding in the 1920s and 1940s. 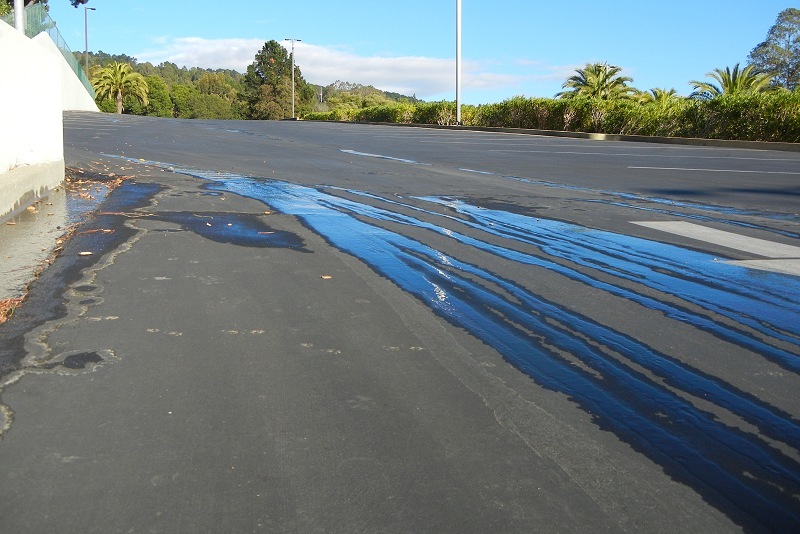 Meanwhile, East Bay MUD put water and sewer lines through, and Shell Oil emplaced a fuel pipeline down the valley to carry gasoline from its Martinez refinery to the Oakland Airport. What could go wrong? A lot. 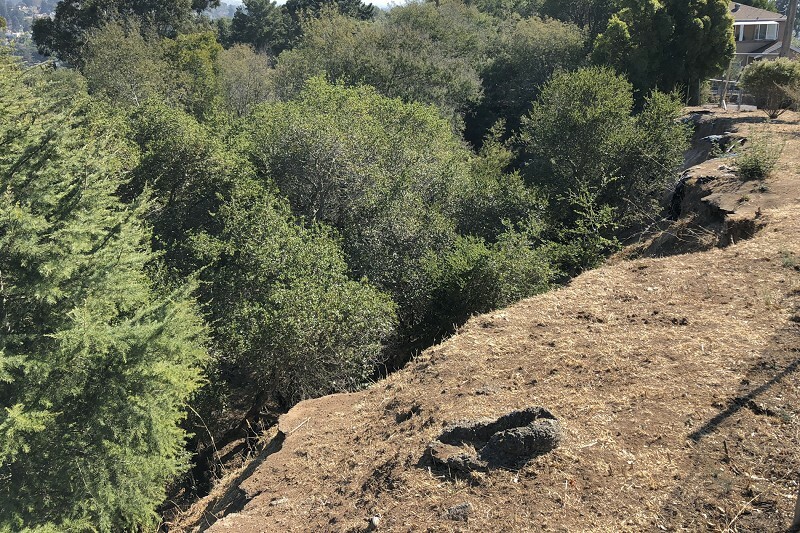 Every steep headwater stream in the Oakland hills is prone to landslides. And this particular stream has carved its charming valley into the pulverized rock along the Hayward fault. Here’s what that shattered, highly weathered material — fault gouge — looks like where it’s exposed in the headscarp. 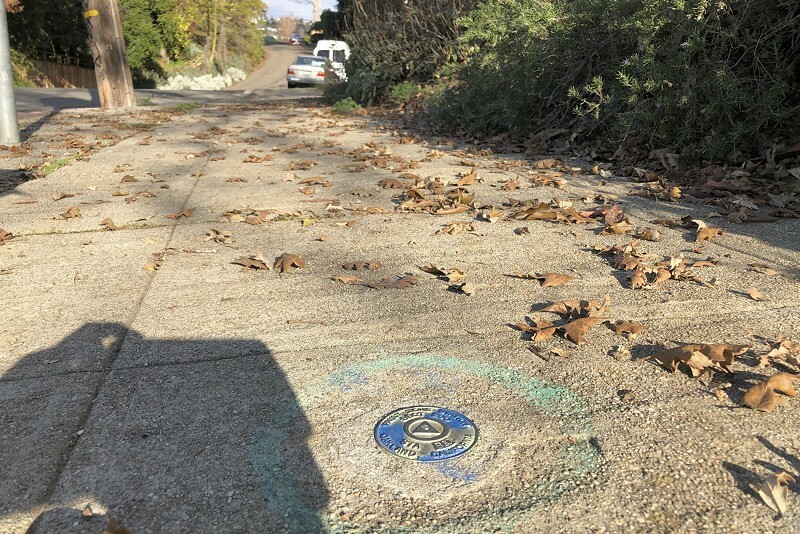 It was mid-February in 1962, on a dark and stormy night, when the combination of heavy rainfall and leakage from a broken water main caused the hillside just south of Maiden Lane to fail. Three homes were destroyed, never to be rebuilt. Who knows how long the main had been leaking, or why. Slow landslides could have broken the main, or steady creep along the fault. Either would suffice, but probably both took part. On top of that, literally, was the added load on the hillslope from the new homes and their construction. 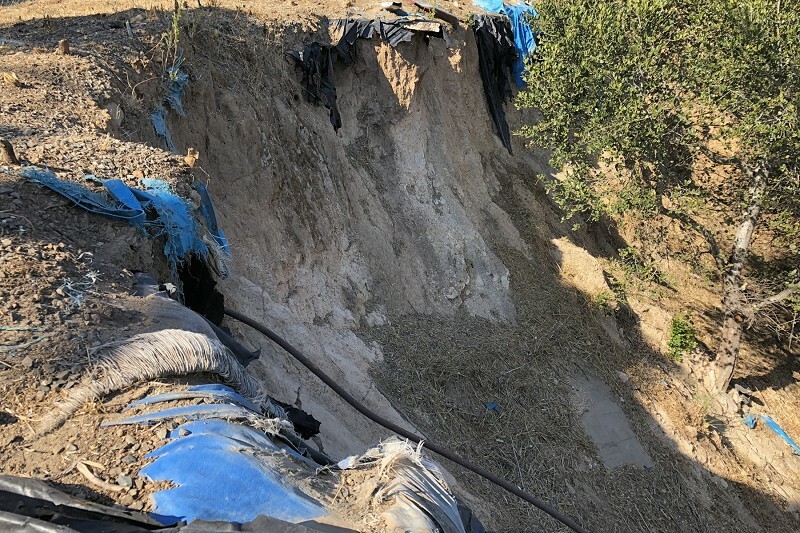 No ordinances were in place at the time to ensure good construction practices on unstable slopes. And of course, for their landscaping, homeowners just added water. The land was probably in motion long before it finally slid. This land at the very end of Jordan Road is still iffy after almost 50 years. There’s also the rock — you knew I’d get around to that. I don’t quite trust the geologic map in this area, but I can attest that serpentinite occurs here as it does in many places along California’s faults. These two specimens are good examples of our typical mixed serpentine rock and blueschist, and large boulders or outcrops of the same are visible in several places. There’s more on the west side of the temple. Serpentinite makes slide-prone ground, too, even when it’s not steep or waterlogged as this place was. But on the whole, my poking around was frustrating because the land is so heavily overgrown and fenced off. 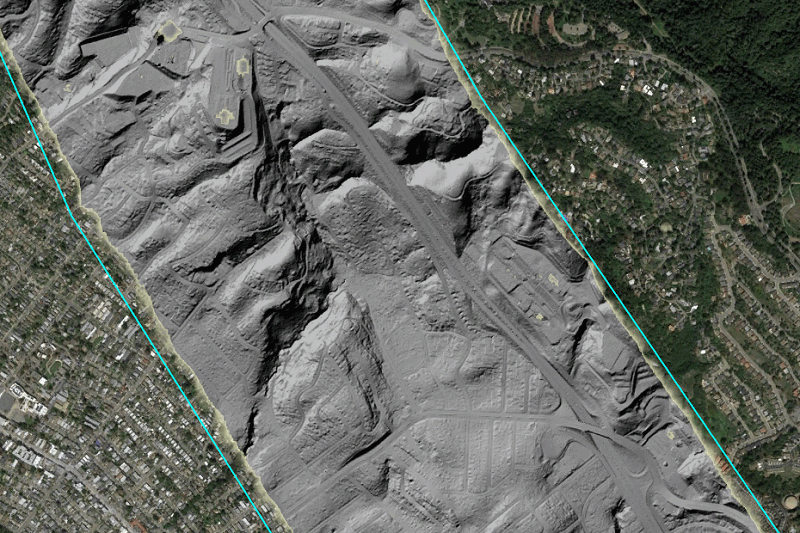 Fortunately the US Geological Survey got funding for a lidar survey of the whole San Andreas fault system, including the Hayward fault, and the processed data — a digital elevation model or DEM, available from OpenTopography — is a fabulous resource for this exact area. 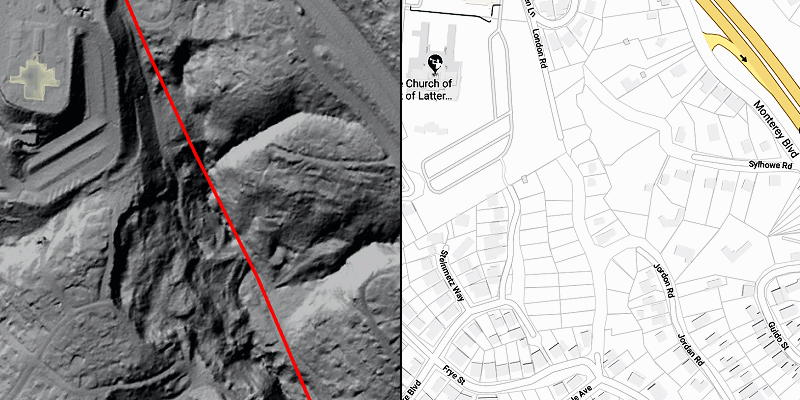 After subtracting the vegetation and the structures from the data, the DEM becomes a grayscale image representing the bare ground, with the ghosts of streets and houses, here computer-illuminated from due northwest. What’s handier, here’s the same with the Hayward fault superimposed. I usually have to do a lot of talking and armwaving to explain things, but not this time. Click in and wander around. The blue outline signifies a sag basin. My final piece is this closeup of the slide area along with the lot lines and rights of way — more ghosts, still there after all these years. There’s just one little house left on the east side of Kitchener Court, right up against the temple property. Incredible as it may seem, the adjoining lot, half fallen downhill with cliffs all around it, has a For Sale sign posted. Talk about a haunted place! When did everything Franciscan begin? 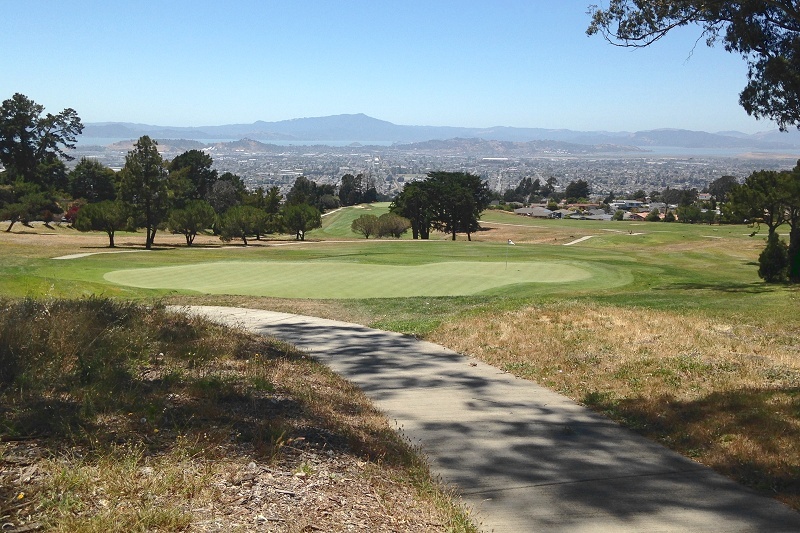 A paper I read last week led me a long way in an interesting direction that started in El Cerrito, just up the ridgetop from Oakland, at the property fondly known as the Mira Vista Golf Course (restored in 2011 to its original glory and rechristened with its original name, the Berkeley Country Club). I first visited Mira Vista in 1999 to see the Hayward fault, which runs through the fairways and helps give the land its picturesque form. Trenching studies there have added to our knowledge of this threatening feature. 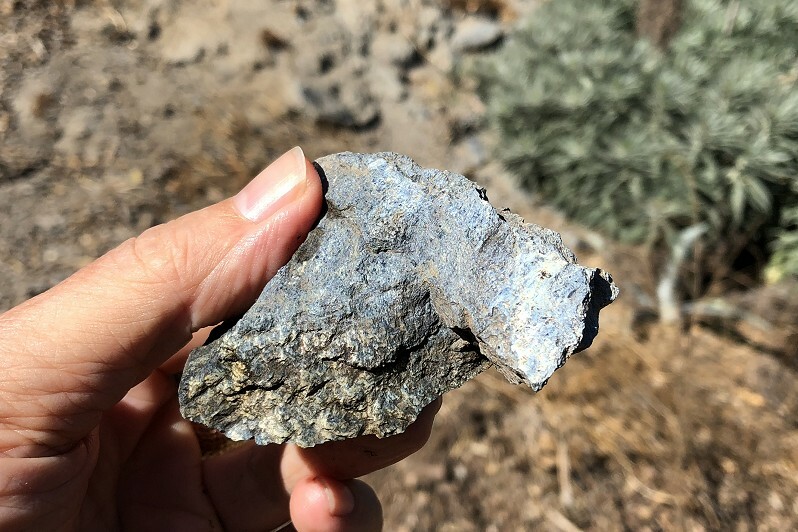 But what brought Mira Vista to mind last week was a paper in the journal Tectonics titled “Early Onset of Franciscan Subduction.” A handful of rock harvested here gave the authors a new answer to an old and vexing question. California is known to geologists around the world as the type example of a subduction zone. Its rocks preserve a record — a messy one — of a long period of geologic time when a tectonic plate consisting of ocean crust was moving toward and diving (subducting) underneath North America, which consists of continental crust. That went on for some 150 million years, interrupted when the San Andreas fault system first formed about 30 million years ago and turned the plate boundary into the sideways-moving setup we have today. During the subduction period, North America scraped off parts of the top of the oceanic plate. That collection of stuff, analogous to a pile of dirt on the blade of a bulldozer, is a mixed-up lithological scrapple called the Franciscan Complex. One of the most basic questions we have about the Franciscan is, how old is it? That is, when did subduction begin? 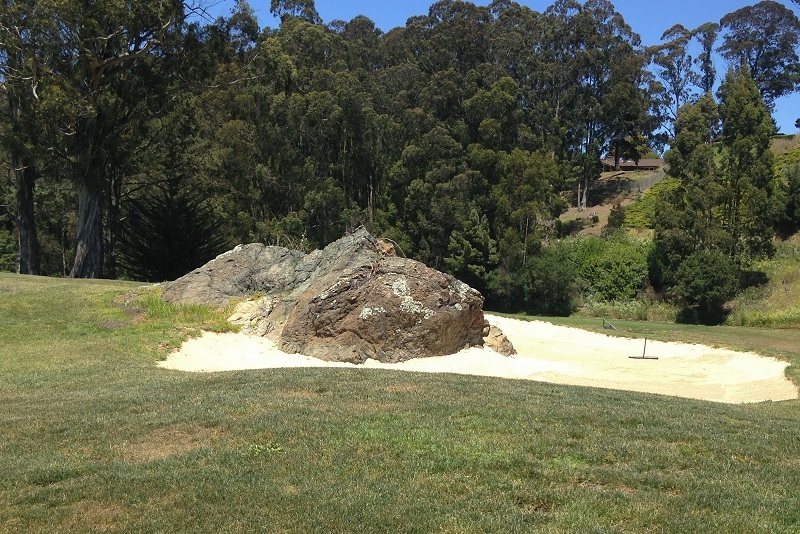 The high-grade blocks are part of the golf course as well as the surrounding terrain. The course is right next to The Arlington. It was easy to get there on the 7 bus line. 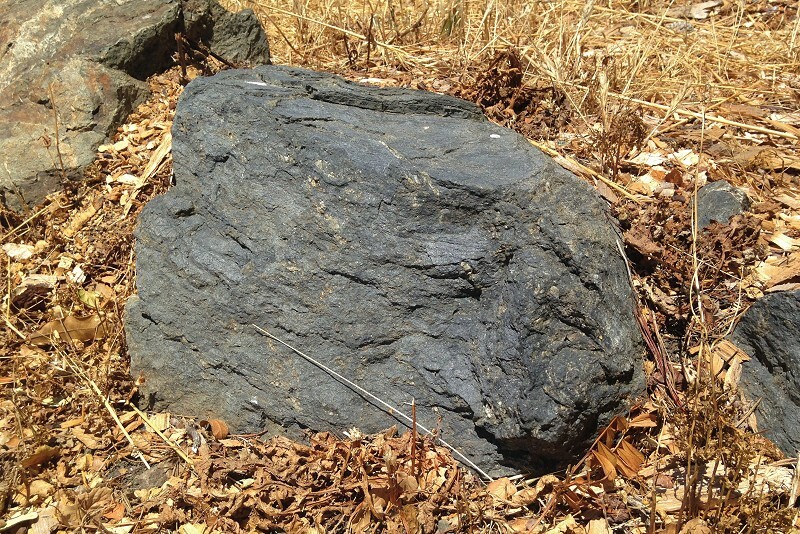 Getting off near Madera Circle, I spotted telltale boulders at the roadside: Blueschist. 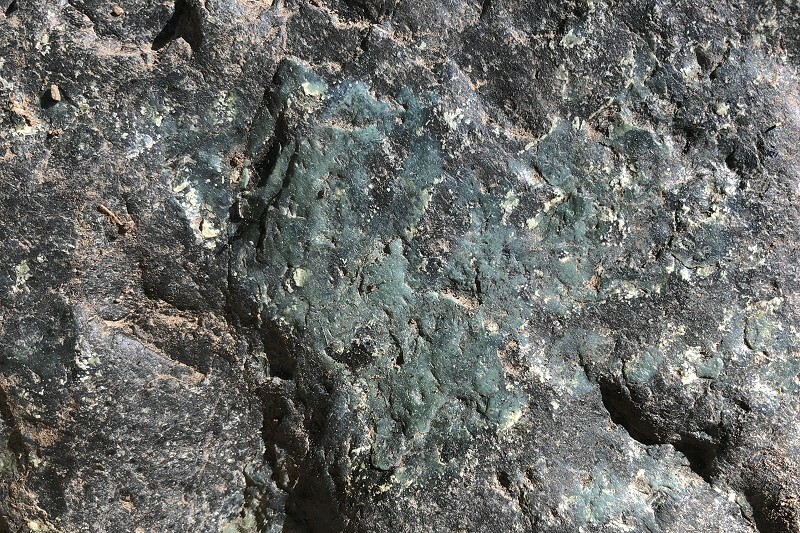 Close up, a fresh exposure of the rock — maybe the actual collection site — glistened with blue and green crystals: the high-pressure metamorphic minerals glaucophane and omphacite. 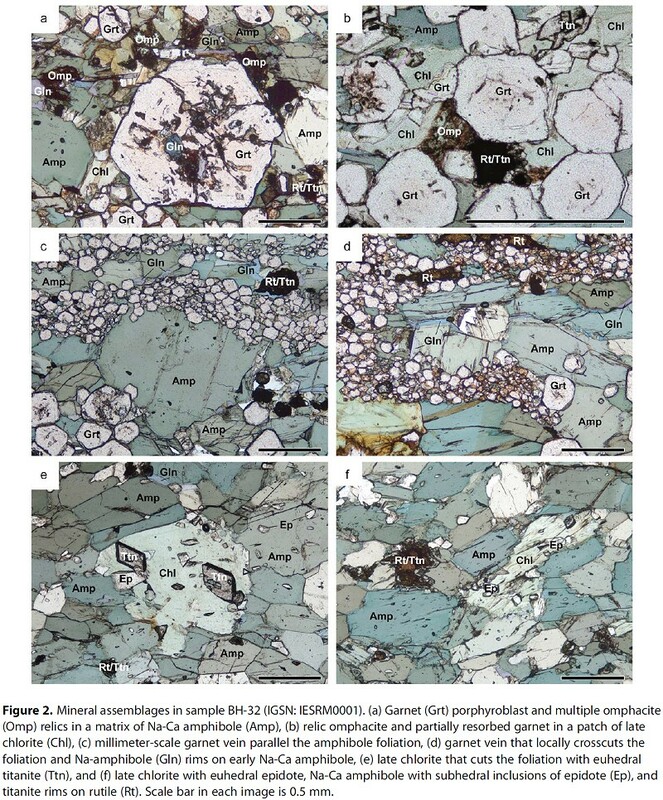 The real work began under the petrographic microscope, where Mulcahy had to untangle the complex set of high-pressure events that affected this rock from the geometry of these thin sections. Briefly, the big garnet grains preserved grains of very old material inside them, protecting it from later reactions. Those grains were about 176 million years old; the same minerals outside the garnets were about 160. Their ages had been re-set during a later episode of high pressure. 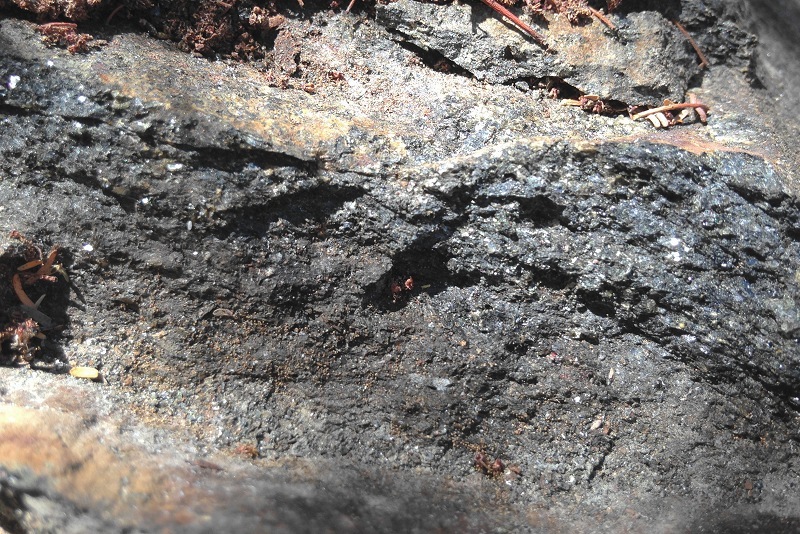 Moreover, the earlier episode had a much higher pressure than the later one, high enough that the rock had been not blueschist, but eclogite (ECK-la-jite). It had been carried at least 50 kilometers deep, a depth only attainable by subduction, and just a few tiny shreds protected inside garnet grains, measured in microns, preserved the evidence. That’s pretty cool. This finding sets a new record back in deep time for the beginning of Franciscan subduction, in the early Jurassic. It also offers a telling clue about another California geology mystery: What’s the exact relationship between the Franciscan Complex and the Coast Range ophiolite? In brief, there are three main hypotheses, and this evidence weighs against two of them and favors the simplest one. That will change the book I’m in the middle of writing. By the way, stairs and footpaths lead from here down through Motorcycle Hill to the El Cerrito del Norte BART station. Take that hike some time. 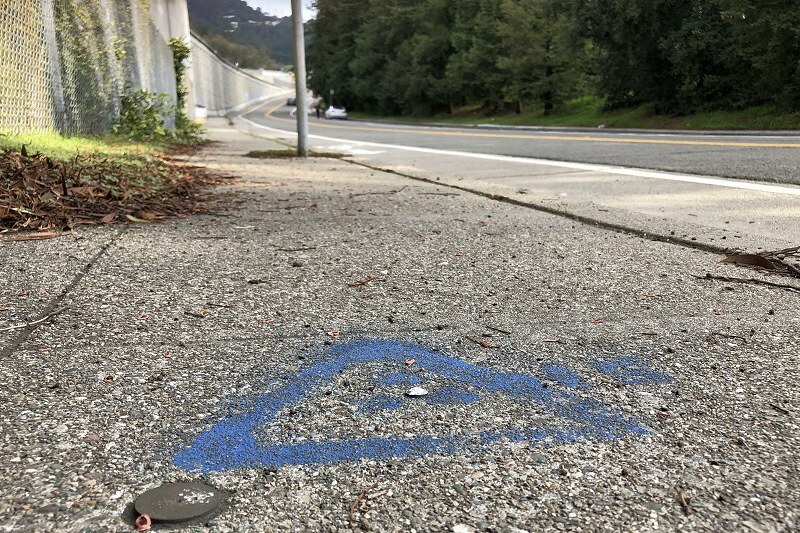 It was a most enjoyable hike that I led on Saturday for the Berkeley Path Wanderers Association, wandering for 3-plus miles in the city’s wonderful rock parks and along the Hayward fault. As usual, visiting the fault has its troubling side, and here I couldn’t ignore the implications of this splendid building, the old Hillside Elementary School on Le Roy Avenue. 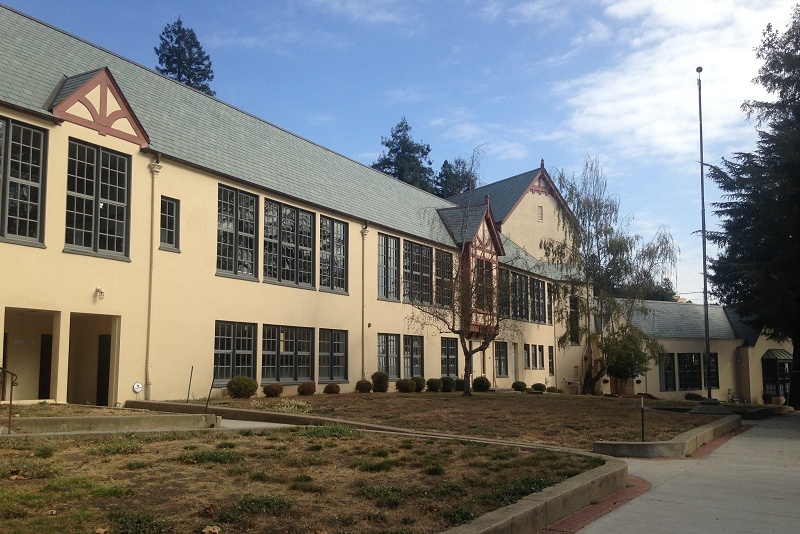 This is the second Hillside School, built after the first one burned in the 1923 Berkeley Hills fire. 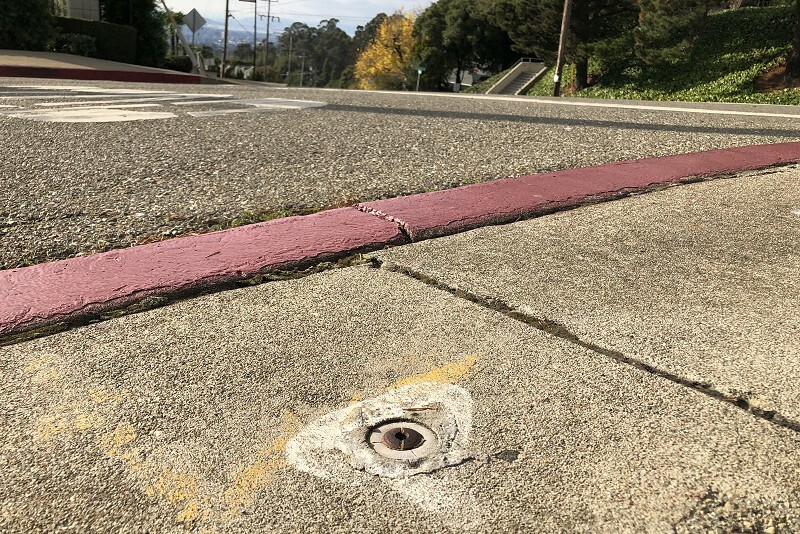 For its time it was well designed, well made and well appointed, but after 50 years scientists confirmed that an active trace of the Hayward fault runs under it. The next major earthquake on this fault will rupture and ruin the structure. Besides that, the site is on a deep-seated active landslide. The clear and present danger to children and teachers led the authorities to abandon the building in 1980. 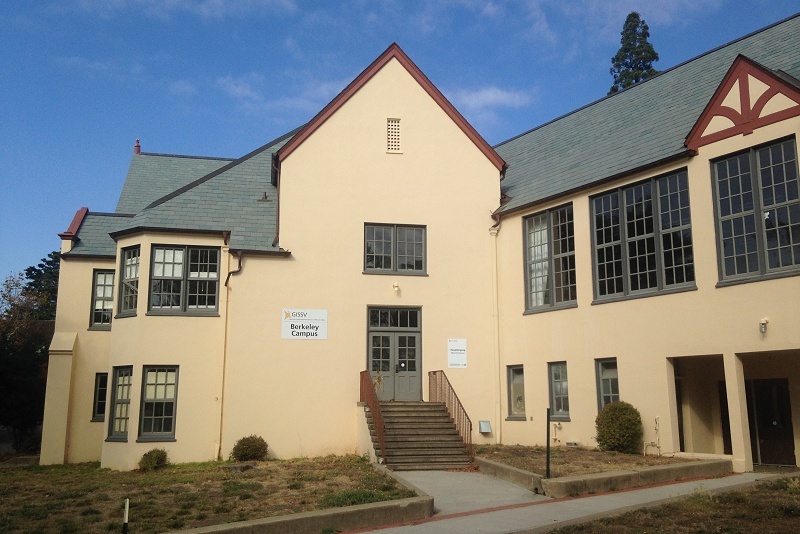 In 2011 the German International School of Silicon Valley bought the site and pledged to do right by the building. In 2016 they fixed the roof with new, historically authentic materials, but at year’s end they moved out after deciding they couldn’t afford any more of the needed work. There are two facts on the ground here. It’s a geological fact that this building is doomed and dangerous. But it’s an emotional and political fact that this building is precious. The city declared the school a historic landmark in 1980, and it’s on the national register too. People love it and have strengthened the structure twice since 1925. But after the next major quake — not to mention a repeat of the 1923 fire — the school will be kindling, or ashes. Spending good money in a lost cause is an example of escalation of commitment, or the fallacy of sunk costs. Without a building here, the site would be an excellent resource throughout the disaster period, and in between disasters an excellent little park. By holding a funeral for a building I mean, for starters, a respectful demolition. Make a virtual-reality model of the structure, recording the rooms and their beautiful wood beams and floors. Collect stories from the people who taught or attended school there. Hold a farewell concert in the old auditorium (with everyone signing waivers). Salvage the good materials. Build a memorial and have ceremonies. All that stuff and more would befit the facts on the ground. I think it would raise the community’s consciousness of disaster preparedness, and at the same time mark the fact that in this case our ancestors won their bet against geology.